From a young age I always knew that I wanted to travel to developing countries and volunteer my time for those who needed it most. Growing up in Australia I have been very privileged from birth, unfortunately millions of others have not been so lucky. It isn’t fair that where you are born can determine your future. That basic human rights like having a roof over your head and food in your stomach are denied from people purely because of their geography. So I wanted to make a difference, no matter how small, and decided volunteering would be the way. 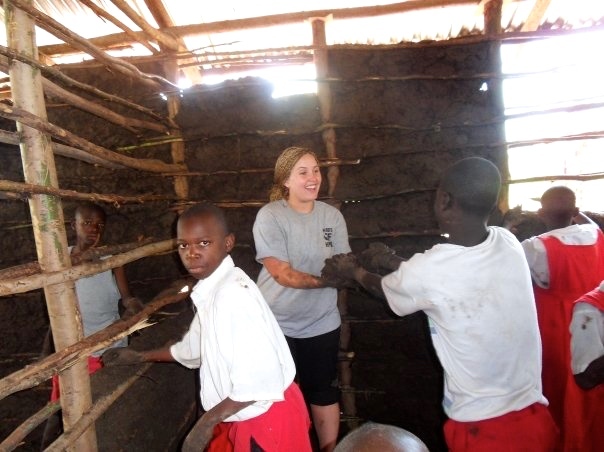 I have volunteered twice in the last few years, the first in Kenya, Africa – and it completely changed my life! I had always known that I wanted to volunteer in Africa so when one of my closest friends created a not-for-profit volunteer organisation helping disadvantaged communities in Kenya I knew that I had to be apart of it. As soon as I finished school I got a job and started the saving process in order to fund the trip. Two weeks after my nineteenth birthday we hopped on the plane and made our way to Kenya. There is nothing like the culture shock you get the first time you travel to a developing country (and truly nothing like the culture shock you get when you first visit Africa). I remember being blown away by the differences. To say I threw myself into the deep end of culture shock is an understatement. You can read articles galore and watch many movies and documentaries on these places but nothing will ever prepare you for the moment you see them with your own eyes. To see the crazy amounts of poverty and the way people are expected to live. We spent a month working in a number of projects. 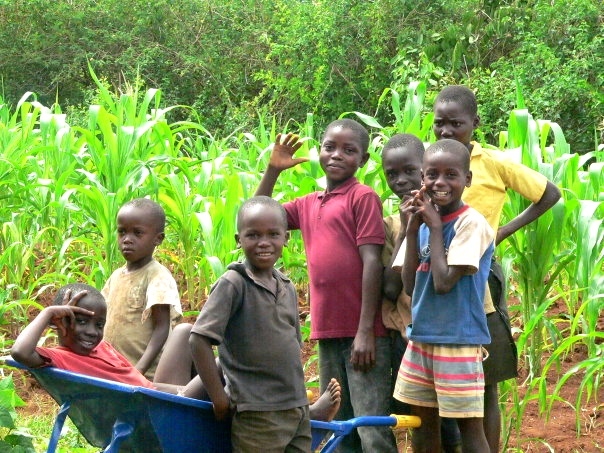 First we spent two weeks in the small village of Akala. The first twenty-four hours were crazy. 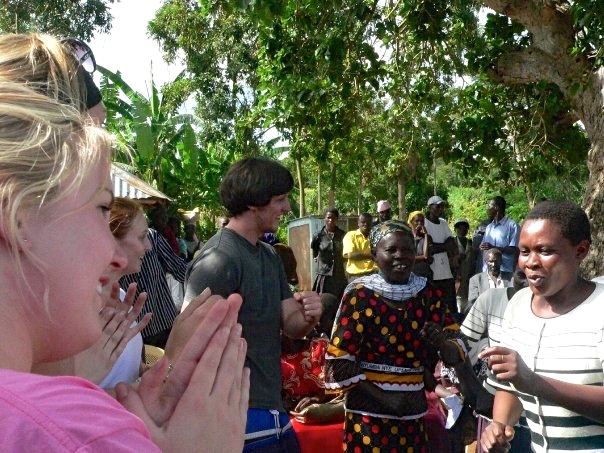 When we arrived we were welcomed by the entire village with hours upon hours of singing and dancing. The Chief of the village and the people were so happy to have us there. When we visited the local food market we were followed around by hundreds of locals, all wanting to shake our hand. I felt like a celebrity! Now, after many years of travel in foreign lands, I am quite accustomed to being looked at in this way but at the time it was the most bizarre feeling, that someone wanted to shake your hand and take your photo purely because of the colour of your skin and hair! I remember being blown away by the food covered in flies and the children who wore no shoes and dirty clothes and the shops that were made from falling apart bamboo sticks and cloth. The young children in the village had never seen white people before and were so scared of us that they would cry and runaway. 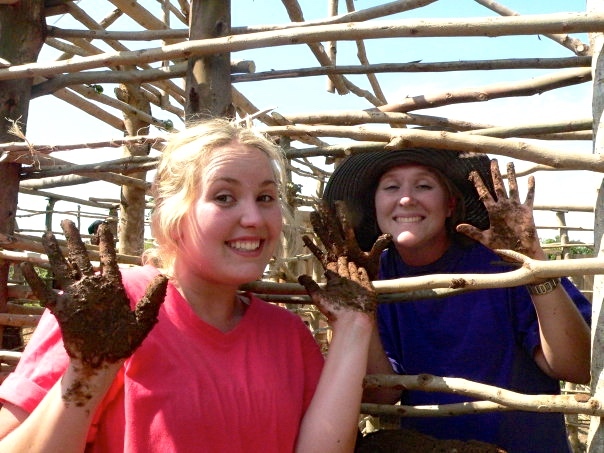 We spent the next two weeks building mud-hut houses for some of the families in the village. 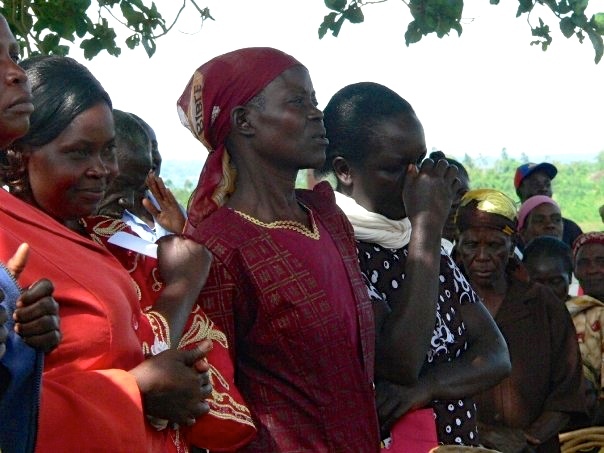 The community had voted together to choose who needed our help the most. Some had been affected by AIDS, some had lost their husbands and some had many children and only a small, one bedroom, falling apart house for them all to live. The work was hard. 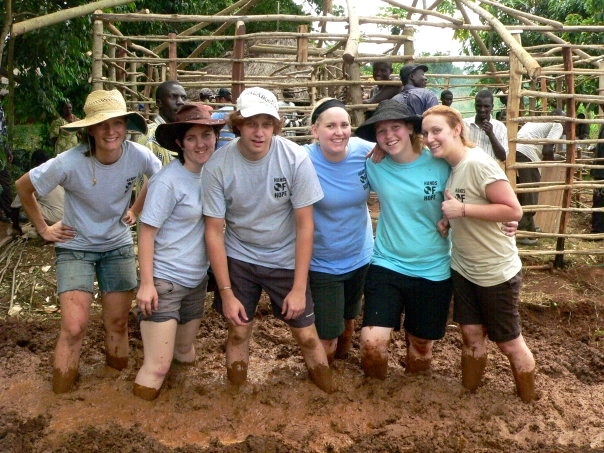 We would wake early, walk to the land of the family we’d be helping, dig arm deep holes with only poles and our hands. Then we would walk to fetch logs which we would carry back and then we would start the process of hammering tree branches together. When that part was done we would then dig up dirt, pour water in and create the mud with our bare feet. It was hard and dirty work, especially in the immense heat, but it was so rewarding knowing that you were helping a family to survive and to make their life a little better. The joy on the family members faces when they saw the finished house was worth it all. In thanks for our work the family would feed us lunch. That was an experience to say the least. You’d be hammering away when all the sudden the lady of the family would grab a Chicken or Goat and slit its throat in front of you. A few hours later you would be sitting down to eat it. It was an eye-opener for sure, we all know where meat comes from but it’s an entirely different experience when you see the process with your own eyes. Obviously, in places like Kenya, you waste nothing so we would be expected to eat multiple plates of food and eat every last part of the animal, including the feet, eyes and tongue. Luckily we had one brave guy in our group who was willing to take one for the team for that part! I’d often feel terribly guilty as sometimes they’d kill their one and only animal to feed us. I just wanted them to keep it for themselves. I wanted to tell them ‘we can feed ourselves, please keep this for you!’ But it was their pride you’d be hurting if you didn’t eat it. It was their way of showing their gratitude, so you would eat every last mouthful, even on the days you felt so sick (like the day I had to wear my sunglasses as I ate lunch to cover the tears streaming down my face because I felt so terribly sick but I couldn’t not eat as I’d offend our friend Soloman). 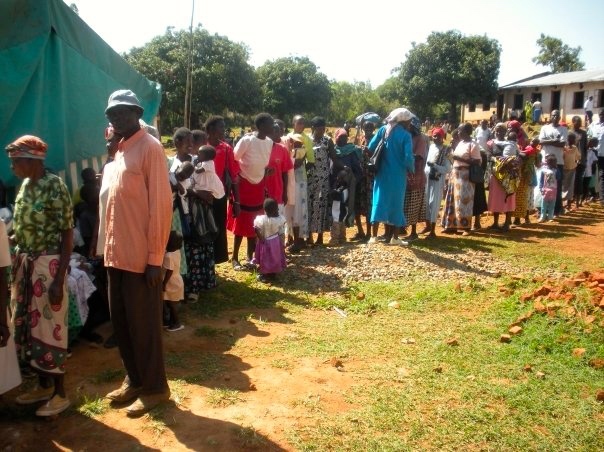 One weekend we held a free medical clinic open for anyone in the surrounding communities to visit. The line was hundreds upon hundreds of people long, who had lined up overnight to ensure they were attended to. Not being medical experts ourselves we paid for doctors, nurses and dentists to work there for the day and paid for all of the antibiotics, immunisations and medical equipment needed. It was overwhelming to see how many people needed help and how minor things like a cut in the foot had escalated to such drastic infections, purely because they could not afford antiseptic or to seek medical attention elsewhere. The thought that such simple infections that we would treat so simply and quickly at home could cause death in a developing country was mind-blowing. During our time in Akala we lived in a very basic house which had no windows or doors and was shared by many, many chickens. 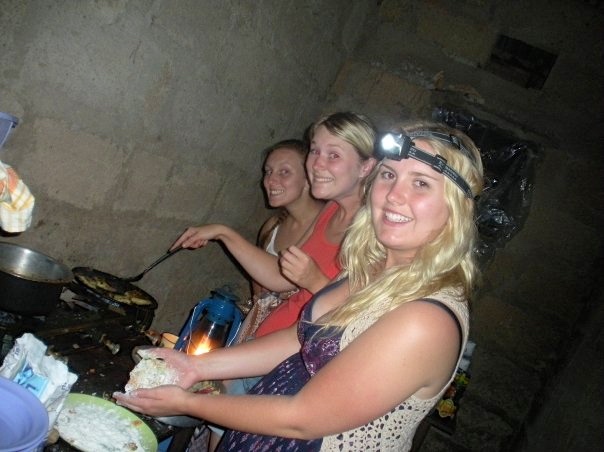 We had no electricity and would cook on our gas camping stove by torchlight. 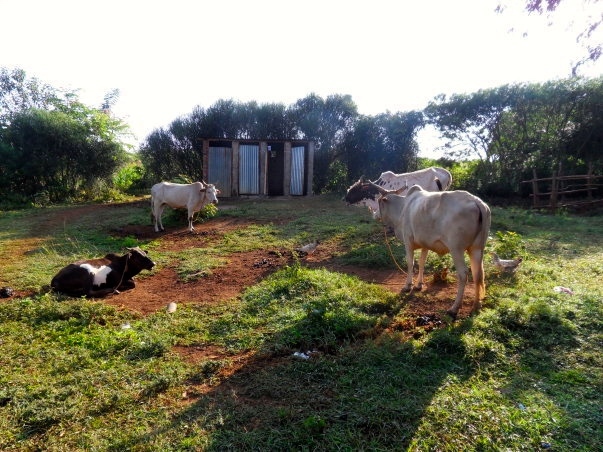 The toilet was a dirt, squat toilet in a shed at the back of the yard with the cows. 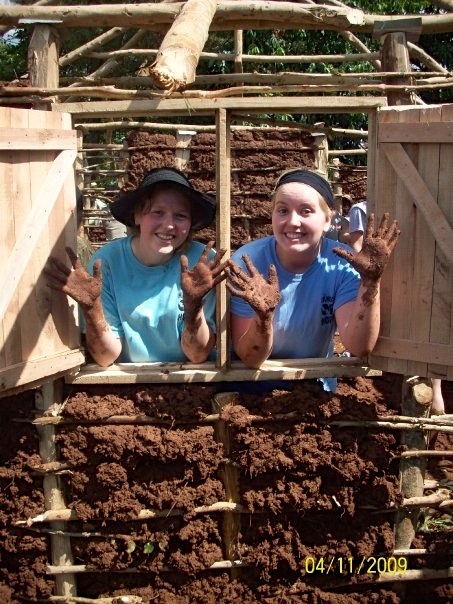 We would wash the thick layers of mud off each night with a half a bucket of water and a sponge in a makeshift shed. We lived super simply but appropriately for where we were. It was the first time in my life I’d really been off the grid, in the middle of nowhere with no luxuries whatsoever. It was a great way to see, in the smallest of ways, what it was like to live like the locals of the community we were helping. 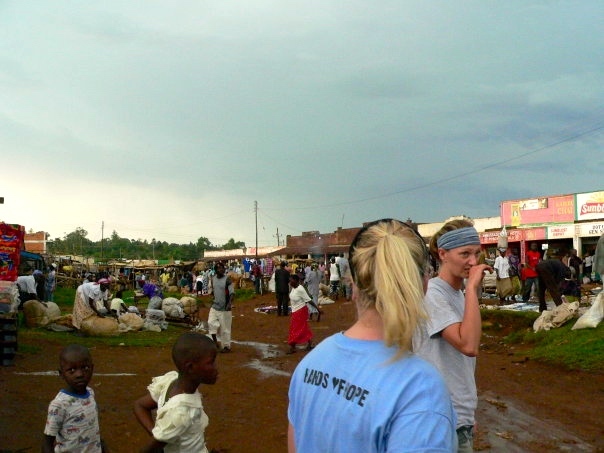 After two weeks we made our way to Kisumu, the third largest city in Kenya. The first project we did was build classrooms for a local school. The principal of Joordan School had an incredibly kind heart and was allowing hundreds of kids from poverty-stricken families to attend school free of charge, which resulted in the tiny classrooms being overcrowded with students. We purchased some land next to the school and started building more classrooms, the first of many projects to be done for the school over the next few years with the organisation. Building classrooms, however, was much more time-consuming than a house and we fell behind on schedule. The blessing of this though was that it resulted in needing more hands, so all of the students from the school came out, bottles of water in tow, and helped us to finish their classrooms. The afternoon was spent laughing and singing songs as we finished building the classrooms together with our bare hands. It’s one of my most treasured memories of our entire trip! 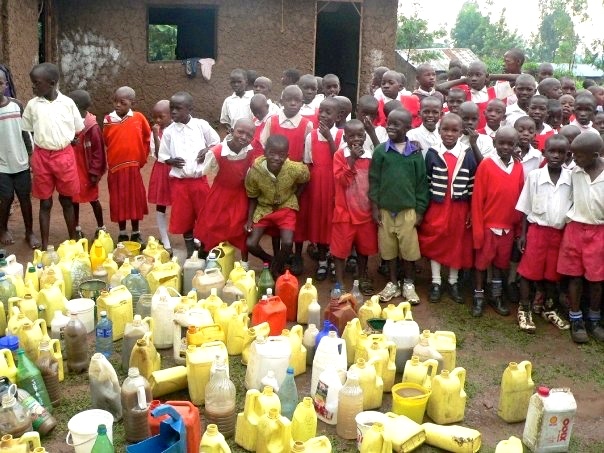 We also worked with the street kids of Kisumu. We volunteered with an on-site organisation who provided a safe place for the children to go during the day. They were fed food, given a place to shower, sleep and play like normal children. The stories I heard were heart-breaking. Stories of children from as young as two years old who were forced to live in the streets as their families had been murdered or died of diseases. 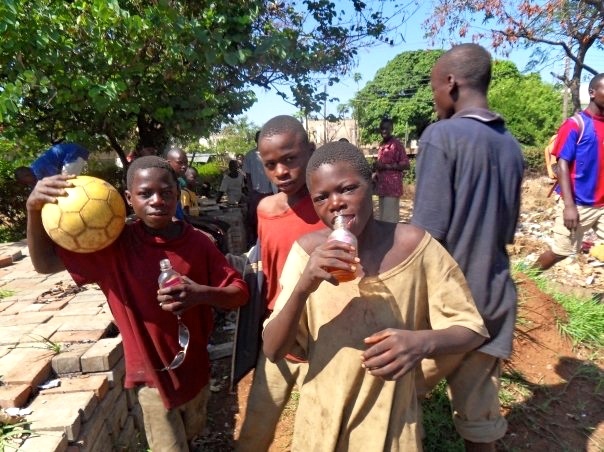 Children who instead of learning their ABCs and playing Soccer faced a reality where they were often beaten and taken advantage of by older men on the streets. Children who are often exposed to violence from gangs and criminal activity. 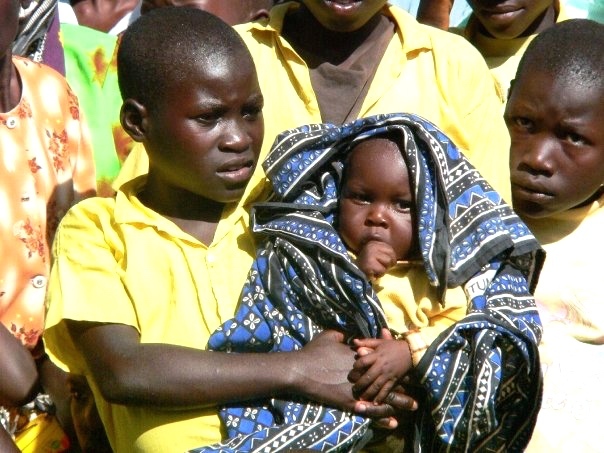 Children who are exposed to HIV/AIDS infection. Children who rummage through garbage for scraps of food. Children who have worked as prostitutes to survive. It is just the most brutally heart-breaking reality you’ll ever see. Children who suffer unthinkable things, things that no person, let alone a child, should have to endure. It was especially hard having to face the reality that so many of these young and innocent children were addicted to sniffing glue. You’d see children and adults alike, walking through the city with a bottle of glue clutched in their hands, their mouths and noses pressed against the top of the bottle as they wheezily sniff and breathe in the fumes, hungrily inhaling the hazardous chemicals. The fumes of the glue suppress their hunger pains and makes them feel warmer. It also puts them in such a daze that they have the courage to eat garbage, work on the streets and beg for money. This addictive chemical fries their brains and slowly kills them. Once they are on the glue the chances of helping them are slim, the addiction takes over. Words cannot even begin to describe how heart-breaking this is to see. 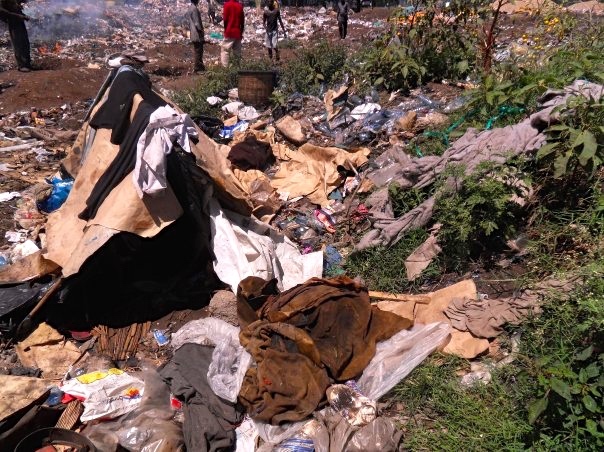 One afternoon we visited a garbage tip, where many of the homeless of Kisumu would either scavenge for food or call the place home. Despite all of the horrible realities we faced during our time in Kenya already, that afternoon was the most heart-breaking of all of them. A lady we met there was so excited to show us her ‘home,’ a sheet of material thrown over two sticks that her and her four children lived in. A ‘home,’ that was set on top of rubbish. 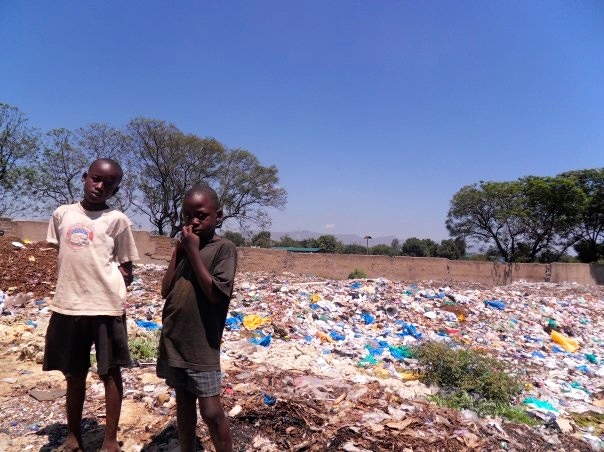 We saw barefoot children scavenging through mounds of rotten garbage trying to find food. There were piles of plastic being burnt everywhere, the fumes and the smoke burning my throat. It was insane to stand there and see that this place was home for some, that this was a place for survival. That this was how people lived in the world, every single day. No matter how much TV you watch, no matter what you read in the newspapers nothing can prepare you to see this with your own eyes, to realise the reality of the world. We returned back to our house in silence. A group of twenty young people who were usually so enthusiastic, loud and chatty sat in silence the entire drive home. We sat in silence, staring into nothing, deep in our thoughts and sadness for hours. We decided to discuss the events of the afternoon together. Our team leader asked us ‘How does this make you feel?’ Everyone sat in silence, trying to find the words to speak. I was the first one to speak and the only word I could find was ‘Guilty.’ Guilty that millions of people in the world lived like this whilst in comparison I lived a life of luxury. I started sobbing with sadness and after sitting in the garden, thinking about everything I’d seen I called my parents in Australia at 3am their time crying into the phone, desperate to feel a small amount of comfort yet knowing that I’d never find it. Knowing that no matter what my friends or family said nothing would make me feel better because nothing anyone said could fix the things I saw today. Nothing anyone said could delete the images in my head. None of them would ever understand what I was going through, none of them would understand just how much I had changed in that month, how much I had changed in that day. That was an afternoon that I’ll never, ever forget. 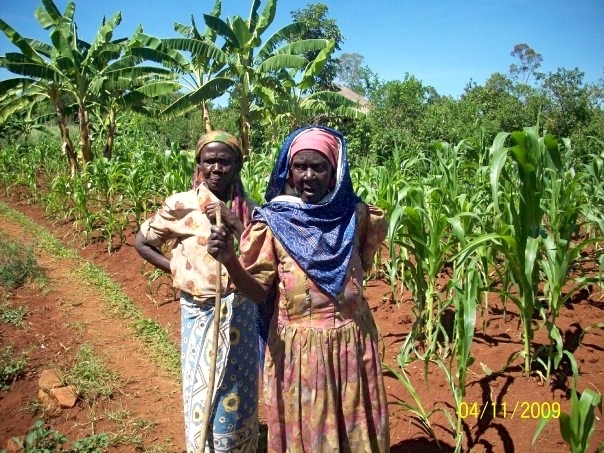 When we returned home from Kenya it was such a shock to be back in the developed world. To come back to a country where it’s normal to have multiple televisions in your house and multiple cars on the driveway. Normal to have a fridge full of food and a tap with clean, running water. It was hard to adjust to the reality of my world after seeing how other people live. It took months for me to recover from my culture shock, to not feel guilty for the blessings I had in my life, for the basic human rights I was privileged enough to have purely because I was born in a developed country. I may have eventually learnt to adjust to being home and to my reality but I was never the same again. Have you ever volunteered? How did it change you? I would love to hear your story in the comments below! Thanks so much for reading. I am so glad that the story moved you. I highly recommend you volunteer, it is truly life-changing! My friends, who’s organisation I went through, has just had a baby so isn’t planning on doing any trips anytime soon. I recommend checking out volunteer HQ or Love Volunteers as they both work with fantastic organisations and are far more reasonable priced than others I have seen. If you are interested in volunteering in India I did it through a fantastic organisation. I will write a post about it soon so keep an eye out!